Despite the ice and snow in the Chicago area this week and the blizzard on the East Coast, there are signs that winter is drawing to a close. The days are noticeably longer. On Sunday, the sun rose at 6:52 a.m. and set at 5:18 p.m. We’ll gain another 15 minutes of daylight just in the next week. 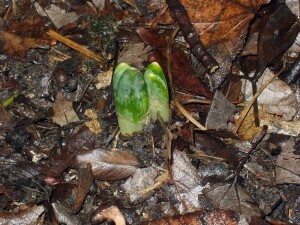 Daffodil shoots are peeking above ground next to my house on the sheltered east side. 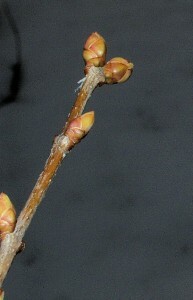 Buds are swelling on my lilacs and other shrubs. Birds were singing when I walked into work last Friday. And I saw people playing tennis outside on Saturday. It’s been a mild winter here, but I’m looking forward to and watching for more signs of spring!